Hello! 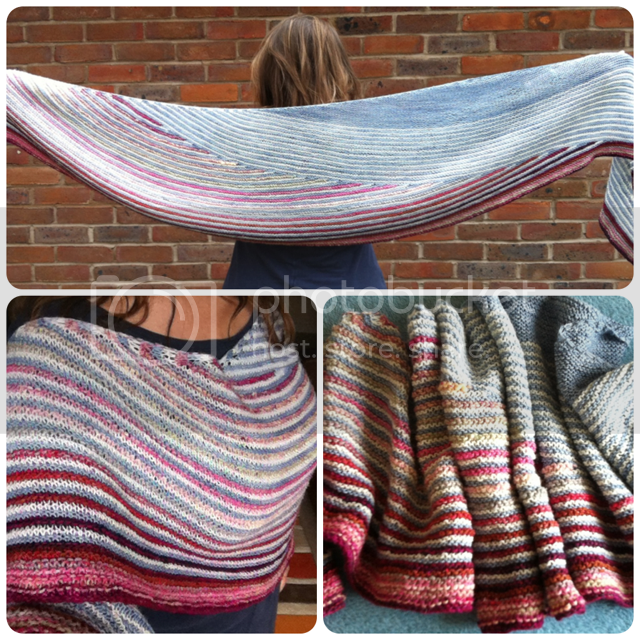 In case you missed last Friday's detailed Ta-dah post, or if you saw it before there was a full-width picture here's another glimpse of my first Color Affection shawl. I've been busy with another project over the weekend but later tonight I'll be casting on a second shawl in some different colours although I'm using Jawoll Superwash again for the ecru and midnight blue colours and yet more Noro - this time Kureyon Sock in shade S102. I can't wait to knit another, although I don't expect to knit it as quickly as the last one! I am so happy to see your lovely shawls in progress and the few that are completed are fab! I've started a Knitalong page which shows the last 50 pictures from the #JSKknitalong Instagram gallery. I love that top shawl the colours are brilliant and so vibrant. I hope my knitting skills get so good I can join in one day. Hello! Thanks for popping over to my blog - I'm a new follower now. Love your blog! Your bio made me laugh, you sound a lot like me! As you know I've started again with some less beelike colours (have added the post link to the linky but it's not turned up yet, finger's crossed I've done it right!). That shawl is gorgeous. I love the colors. I wish I could master knitting like you have. I would make one. Gorgeous, I love it, this one is going to be on my Year of Projects list. Well done. The colors go so well together. You are such a clever lady.